• A washed denim jacket buttoned front closure, jersey long sleeves and removable hood, 2 chest patch pockets, 2 slant pockets. Classic without boring design keep you snug, stylish and fashionable all year round. It is suitable for your outdoor, business, everyday activity. This jacket which is perfect combine with a tee and a jeans for build-up your smart causal everyday fashion. Denim jacket is no doubt for all year trend. 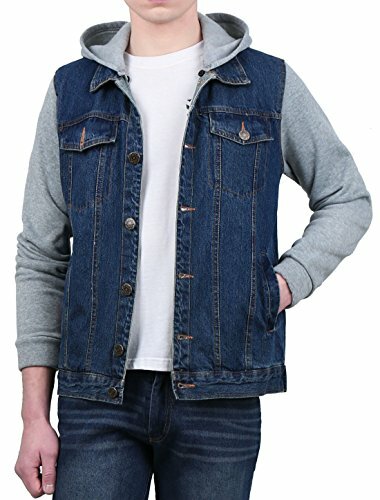 This jacket with washed denim + jersey panel sleeves and removable hood which is special design for making classic denim jacket without boring. It's suitable for casual and outdoor everyday activities and easy build-up your smart causal fashion.